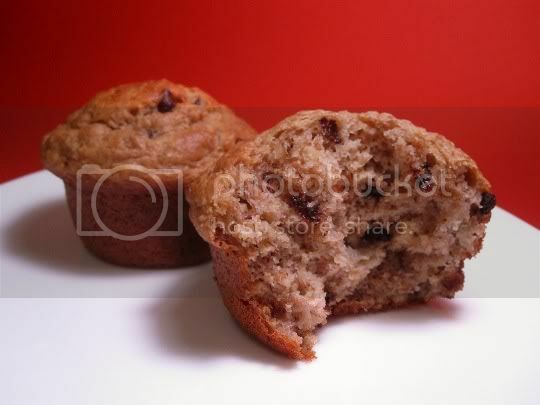 Bananas and chocolate...always a great combination, and these muffins definitely show and prove. I let the bananas sit and ripen for TWO WHOLE WEEKS, so you can imagine how sweet they were for this recipe. What's even better is that the batter uses two whole wheat products: whole wheat pastry flour and wheat bran. The flour (in addition to regular all-purpose) makes these muffins light and cake-like. This was my first time using wheat bran, and I like it: it adds a nice heartiness and crunch to baked goods. But the chocolate really gives these a decadent, rich flavor...almost too good to eat for breakfast! I also like that nuts are NOT included in this recipe; in my opinion, nuts ruin most baked goods...and the chocolate is the only addition needed for these (but okay, I suppose you could add nuts if you wanted to). This a simple recipe, but I did need to increase the baking time by about 7-8 minutes. Vegan variation: Use a soy variation of buttermilk (add vinegar to regular soy milk), egg replacer, and non-dairy chocolate chips.